SAVE OUR GREEN BELT – Ducking the issue! I could not resist this so took a photo. 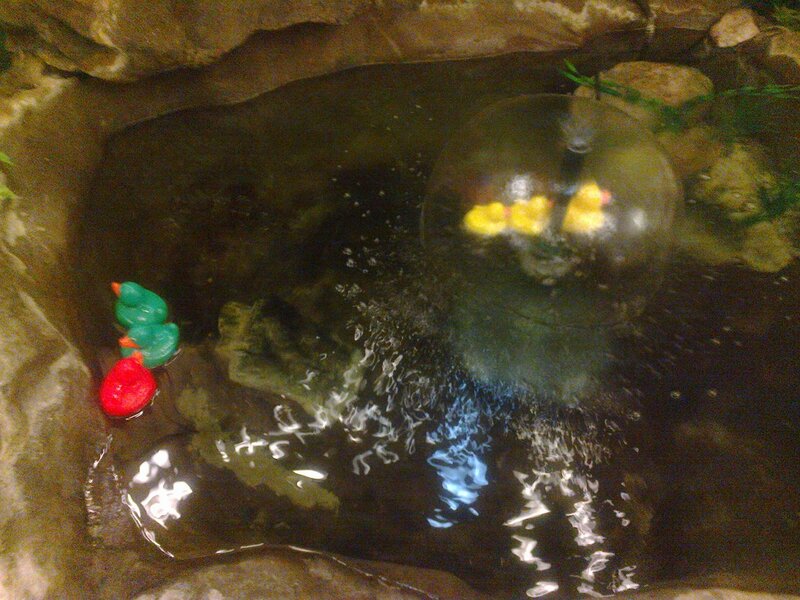 It is the small fish pond in Bootle Town Hall and as luck would have it when I took this photo the 3 yellow (Lib Dem ducks) were all in a row, whilst Peter Dowd’s (Labour) red duck had been captured by a couple of green ones. I presume the green ducks are Green Belt/environmental campaigners looking to hole poor old Peter below the water line because of Labour run Sefton Council’s highly unpopular draft Local Plan. 1.1 A review of the governance of the Liverpool City Region (LCR) is overdue. The LCR as presently constituted is neither effective nor transparent. It is certainly not accountable, either to its constituent authorities or to the wider public whose interests it exists to serve. 1.2 We are severely disappointed that the opportunity for a more fundamental review has not been taken. The options outlined in the Governance Review merely formalise the existing arrangements, albeit with the inclusion of transport. 2.1 The biggest problem is the geographical area of the existing City Region. It is neither small enough to be local, nor large enough to be truly effective in the stated aim of creating jobs and driving economic growth at a sub-regional level. There is no recognition given to the strategic importance of co-operation with Lancashire County Council. 2.2 The current area of the LCR is dominated by Liverpool City itself, yet important parts of Liverpool’s economic hinterland and travel to work area are excluded from the LCR. The existing LCR does not even cover both banks of the river Mersey for its tidal stretch. 2.3 Important areas such as Ormskirk, Skelmersdale and Ellesmere Port are excluded. Edge Hill University in Ormskirk is a major contributor to the knowledge economy and a national resource for medical and teacher training. The petrochemical plants in Ellesmere Port are also of huge economic importance. 2.4 The opportunity must be taken to negotiate with West Lancashire District Council and Cheshire West & Chester Unitary Authority with a view to their participation in the proposed Combined Authority. This would add economic clout and go some way to mitigate the over-dominance of Liverpool City itself in the sub-region. 2.5 Most of the land boundary of Sefton is with Lancashire and people in the North of Sefton look as much to the east as to the south. It is important that the LCR establishes a formal partnership with Lancashire County Council. 3.1 We understand that the Merseyside Integrated Transport Authority has already voted to wind itself up and place Merseytravel under the aegis of the proposed Combined Authority. The fact that Merseyrail reaches Chester and Ormskirk strengthens the case for extending the LCR to include these areas, given the strategic importance of transport to economic development and job creation. 3.2 A sizeable number of people commute eastwards from the Southport area, yet the Southport – Wigan – Manchester rail line has suffered from chronic under-investment for many years. No progress has been made towards the long awaited Ormskirk by-pass, despite improved transport links being a key requirement identified when hospital services were split between Southport and Ormskirk. 3.3 There is no direct rail link between Southport and either Preston or Ormskirk. The lack of a direct rail service from Preston and the north is a drag on the development of Southport’s visitor economy, which forms a key component of Sefton’s economic strategy. 3.4 Improving road and rail links east and north-east from Sefton should be a priority for the LCR’s transport strategy. This would be facilitated by extending the LCR to include West Lancashire and by the creation of a formal partnership with Lancashire County Council. 4.1 We don’t feel that any of the options outlined in the Governance Review document will effectively meet the criteria of promoting economic regeneration, development and transport. It is not too late to persuade the Government that more time is needed to do the job properly. 4.2 We are particularly concerned about the inadequacy, and uncertainty, of the proposed scrutiny arrangements set out in paragraph 9 of Appendix One of the draft scheme. 4.3 There are no clear terms of reference or powers for the proposed Overview and Scrutiny Committee. Any establishment of sub-committees or co-options will be subject to the approval of the very body that the OSC is meant to scrutinise. 4.4 In the absence of any guarantee of proportionality on the OSC, it is entirely possible that all the members of the OSC will be members of the same political party as all the members of the LCR executive body. Not only would that be bad governance, it would lead to poor scrutiny and inflict reputational damage on the LCR. 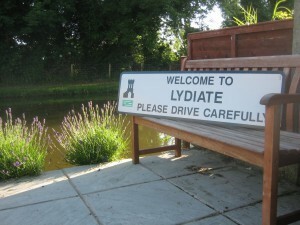 Lydiate Parish – Boundary signs on the Leeds Liverpool Canal? Well no there aren’t any actually but it is a thought because there is quite a bit of barge traffic travelling through Lydiate these days. 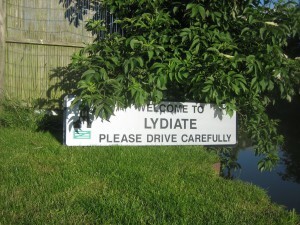 Indeed, Parish Council Chairman Dave Russell has pondered on putting Welcome to Lydiate signs at either end of the stretch through the Parish showing where boaters can pick up supplies, have a pint, a meal etc. A similar thought occurred to me when I ‘rescued’ the Lydiate boundary sign a few weeks ago after the road crash in Southport Road (see previous posting) so I stuck the sign at the end of my garden, which is on the canal, and photographed it. Just for laugh you may say. There were 4 very clear messages coming across from the electorate in the three Maghull wards where by-elections were held last week. Firstly, residents are heartily sick of Labour’s local infighting and the consequent 7 Labour councillor resignations. One thing the electorate does not like is political party splits and this recent long-running one has really damaged Labour’s credibility. Secondly, Labour’s proposed Green Bin tax for Sefton Borough has clearly been binned by the electorate. There can be little doubt that it has really got people upset as they see it as an idea from Bootle Labour Party being imposed on a community like Maghull (but you could easily say Crosby, Formby, Southport etc.) where virtually everyone has a garden. Residents also see it as a back door Council tax rise and are having none of it. The outright lie that was published in one Labour election leaflet which said that the Lib Dems were bringing in the Green Bin tax and that Labour was opposing it was openly being laughed at as ridiculous desperation. The third big issue was the Green Belt. Labour councillors voting to build on the Green Belt whilst saying they opposed building on it has made folk angry. This is a huge credibility issue for Labour and time after time people have been saying things like ‘Labour said they were not going to let building take place on the Green Belt and then their councillors go and vote for just that!’ Interestingly, Cllr. Peter Dowd, the Labour Leader on Sefton Council and a Maghull Town Council member seems to have a little more credibility than his Labour colleagues over this issue. Electors had noticed that whilst he was advocating building on the Green Belt, which they opposed, at least he was doing it by promoting it as a positive thing rather than saying one thing and doing another whilst blaming just about everyone else, as his Labour colleagues have been doing. The final issue is a national one. Labour’s national position of recently embracing austerity and agreeing to follow Coalition spending plans, if Labour gets elected at the next General election, is making people wonder why Labour locally has been presenting itself as being against all cuts and seemingly giving the impression that it will reverse them. This issue is important in a community like Maghull because of the high numbers of public sector workers. Obviously, Labour’s ploy nationally, between 2010 and early 2013, was to play to this public sector worker audience. However, with Ed Miliband now backing off from that message it leaves local Labour Party folk who continue to hammer this for all they are worth very exposed. Public sector workers now know Labour will not reverse the cuts in their pay, pensions etc. so why should they continue to troop out and vote for a party that promised them everything but then dropped them like a stone. These are the factors that led to the significant collapse in Labour’s share of the vote in the 3 Maghull Town Council by-elections. Green Bin Tax – Has Labour run Sefton come unstuck with their attempted back door Council tax rise? Following Lib Dem campaigning which highlighted what we all knew already i.e. that folks will not be ‘volunteering’ to pay Labour’s back door Council tax rise, it seems that the comrades are sounding the retreat and looking for a way out. Frankly, why Labour ever thought residents would pay to have their green bins emptied beats me. What’s more whilst the comrades on the cabinet that runs Sefton are all from Bootle, where there are fewer gardens, the biggest losers under the plan would be communities like Maghull where many houses have big gardens. Sudell Ward (North and East Maghull) for example was going to feel the hit of Labour’s green bin tax as would the two Formby wards and indeed virtually all the wards outside of Bootle. This all makes you think that the myopia of looking at things from a Bootle only perspective leads the comrades into not seeing the bigger picture. We await some firm proposals from Labour run Sefton to confirm that they really are ditching their garden tax but to date the Lib Dem campaigning has certainly given them a lot to think about; indeed Labour’s lawn really has been given a low cut! A few random events – Maghull Council meeting cancelled, thoughts for Library staff & what’s going on with Southport Pier? I got a call this morning to tell me that the Maghull Town Council meeting due to be held tonight was to be cancelled due to the Acting Town Clerk being unavailable due to illness. I can’t recall a meeting being cancelled before because of officer illness in all my years as a Maghull Town Councillor but let’s hope that our Acting Town Clerk is well soon. 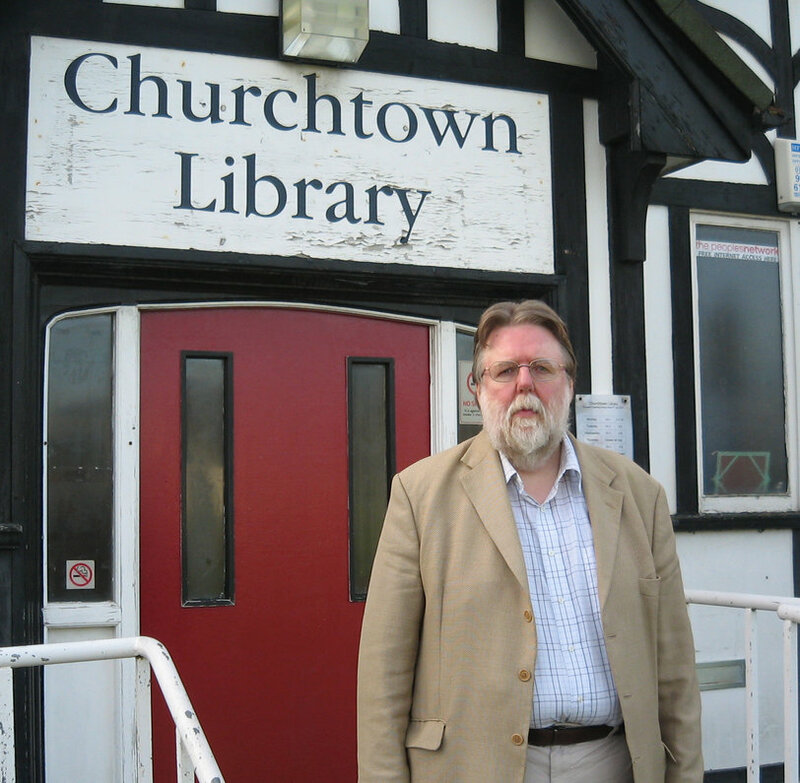 Tomorrow is the day, I am told, when Sefton’s Library staff will find out the employment consequences of the Labour run Council’s Library closure programme. 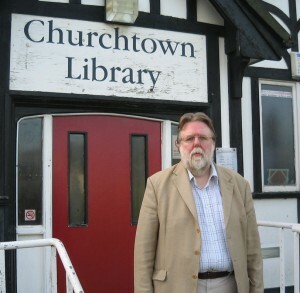 I came across many helpful friendly library staff when I was visiting the libraries under threat of closure a few months ago and I covered my visits at length on this blog site. I think we will all feel for them. And what about the surprise news regarding Southport Pier and the cracks in it? The pier tram has stopped running and engineers are giving the whole structure a detailed examination. Let’s hope for some better news here as Southport pier is to repeat a phrase I used recently on this site, in respect of Bootle’s Litherland Road canal bridge, an engineering gem.